Mort Kunstler Limited Edition Artist Proof Print:"The Professor from Virginia"
Size: Paper 11" x 9" (Overall size: 15 1/2" x 13") / Canvas 14" x 11" Select option from Drop Down Box Above. Edition: Artist Signed and Numbered, Limited Edition on paper with 100 AP's with 100 Canvas Giclee editions. Medium: Fine Art Print on Paper (AP) and Giclee on Canvas editions. About the Edition: The MKunstler Studio Collection features superb signed and numbered, limited edition fine art prints in a classic size designed to enhance smaller wall display space - and the limited edition prints start at the remarkable price of $95. About the Art: Thomas J. 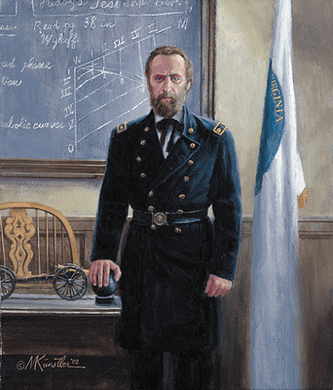 "Stonewall" Jackson was a professor at the Virginia Military Institute in Lexington, VA when the war began. A member of the West Point class of 1846, he had served in the Mexican War and emerged from that conflict with the brevet rank of major. In 1851, at the age of twenty-seven, Jackson left the army for the classroom. No thank you, I just want the 11x9 unframed AP print.